With Laconia’s 92nd Motorcycle week starting on June 13 to June 21, it gives us a reason to look back on my first Laconia Motorcycle week. A 90+ degree early summer Friday about 20 years ago I set out on my Duck Tape sporting 1987 Honda Nighthawk (please don’t be too jealous) following a group of newly discovered friends kind enough to let me tag along for my first Laconia Rally. This pilgrimage was my coming of age, a rite of passage and the first time that I would truly witness the lore that defines one of the most iconic subcultures of America. This was a defining journey… One that would start a lifelong bond between this man and his machine. From the moment we turned off RT 93N to NH RT 11 and then 11B the excitement about the weekend would only intensify. Within minutes (traffic dependant) we would arrive and I’d understand why a hundred thousand people from all over the country flock to a small town in New Hampshire to spend their hard earned vacation time! 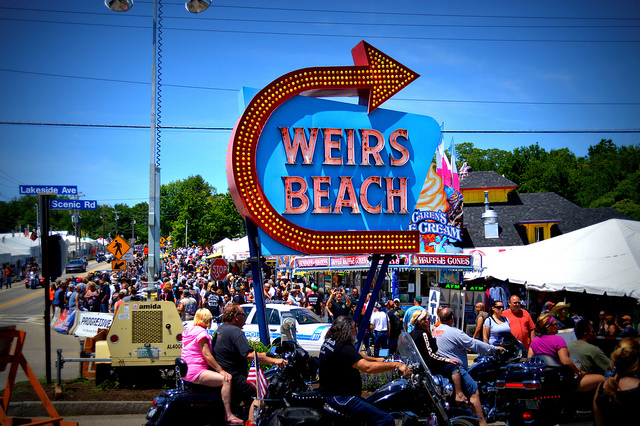 After negotiating parking we ventured to Weirs Beach – a row lined with thousands of bikes. Choppers were the order of the day and the stretched, raked and chromed were status symbols. To my young and unseasoned eyes, this spectacle was one of the most awesome scenes I had ever witnessed. Incredible artwork shrouding eardrum shattering power plants as far as the eye could see! The Laconia faithful seeping out of bars, flooding t-shirt shops and patiently waiting their turn at fried dough stands. It dawned on me that this is a carnival designed for us, the less discerning but much more entertaining adults of New England! After a cold one and a few snacks we moved venues to the field of vendors in search of a mirror that fit a metric cruiser. Yours truly may have been looking for a sweet upgrade to the stock donkey ears stock Ole Blue (pet name for my starter bike). Unsurprisingly, the options for mirrors along with floorboards, tank painting, dyno-tuning and every other option were limitless. We set up nearby Weirs and took part in the evening festivities before getting ready for a spectacular ride up Mount Washington the following morning. While the scene at Laconia 20 years ago was incredible for a newcomer, the event has grown an order of magnitude over the following decades. The quality of bikes has improved, the visions of builders have diversified and the events go well beyond fried dough and vendors. One thing doesn’t change, it is a place where we all decide to take a few days off work and spend time surrounded by people who prioritize the world they way we do… bikes, the lifestyle of freedom and curvy open country roads. After a snow-clobbered winter like we just experienced, we need a 90 degree Laconia Motorcycle week more than ever before. Unfortunately we’re not unlike all of you – we have to take a few days off work to make the trip up north. That brutal winter limited work for a few of us meaning taking a few days to cover a rally wasn’t an easy decision. This year Beantown Baggers is especially lucky and thankful as for the first time ever we have a sponsor who is backing us to provide the incredible Laconia coverage you’ve grown to expect from this publication. Progressive Insurance has partnered with us to cover this rally as we have for years. We will be receiving a little extra access to a concert being held for Laconia attendees as well as other interesting events that contribute to the spectacle that is Laconia. Some of these events include Flo’s Chop Shop on Weir’s Beach, giveaways and light bike washes (with owner’s permission) at Loudon’s Speedway where we’ll be watching the races. Progressive has provided the band schedule available online here: http://www.laconiamcweek.com/schedule/band-schedule. Before you ask: did we sell out? No, but couldn’t afford the time this year if it weren’t for Progressive’s help. Many things have changed since I first pulled into Weirs Beach and the first time I ventured up Mt. Washington. The event is much bigger with better entertainment and much more to do. Builders have pushed the envelope to drastically improve the custom creations. Bobbers and baggers have replaced choppers as the bike du jour and I have traded my Nighthawk for a Harley (and then another Harley and maybe one more). With all of these changes, one part of Laconia Motorcycle Week event is consistent: It is New England’s own rally, held within spitting distance of the country’s best roads. More importantly it is ground zero where we can share road tales with people who have a true interest in where we’ve been, where we’re going and the roads we will take along the way. 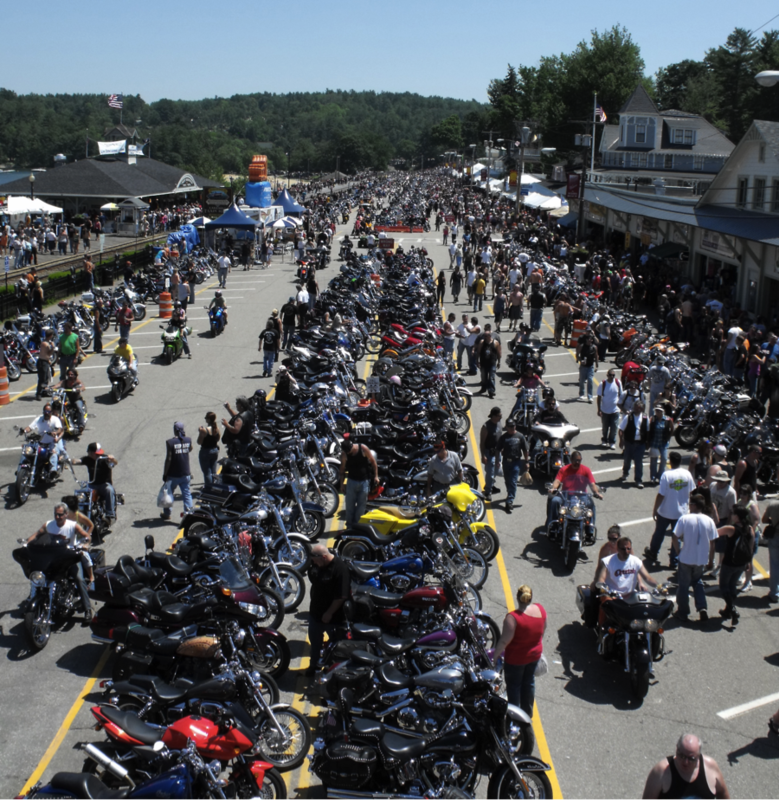 What was your first Laconia Motorcycle week like? What was the most memorable moment you had at Laconia? Will you be going this year and will we see you there? If this is your first trip to Laconia, let us know about your first trip – undoubtedly it will be unforgettable. Write to beantownbaggers@gmail.com to tell your story. We’ll likely post it during the rally. Also, if you see one of us walking around, stop and say hello. We’ll likely have some pins, stickers, shirts and hoodies available for Beantown Baggers fans. Beantown Baggers has partnered with Progressive Insurance to bring Beantown Baggers readers the best Laconia Motorcycle Week coverage possible! Nice piece, last yr was my first trip up there most people rag on it especially old timers . To many cops not enough T/A. So last yr me and ten of my newly made friends made our way up 93 and stopped for breakfast just west of Meredith some 50s dinner. Then made our way to Harley at that point it started to sink in holy craps look at all these bikes. We walked around all the vendors for awhile then saddled up for the mother ship aka the wires. Well it didn’t take long to realize I was approaching something I never attendend before and it was the coolest feeling rolling down the hill towards the wires with my ten friends and at least another ten more we made the turn onto wires and I was blown away. We scrambled and found parking spots. I was luckey to find a spot in front of my buddy’s tent. From sin city cycles. So right away I felt right at home and I was sarrounded bye millions and millions of motor cycle maddness. I was so excited I almost forgot my kickstand. I’m kidding of course.well I finally found my crew we walked around bought some shirts oooo and ahhhd at all the scenery . Laughed at some shirts. Saddled up and went on a great ride thru new Hampshire over to Bentley s in Maine for food and fun saddled up and took back roads down to Saugus ma. Sometime around midnight. It was my cherry popping Liconia trip. If I ever could spend a few days Im sure it would be a lot of fun but for now it’s gotta be a day trip. Oh well as you can see I usually make good use of a day trip. Hope you enjoyed my experience. Ride hard boys and girls or stay the **** home. Peace lov and respect to all! !